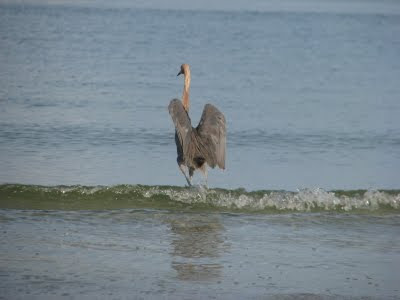 Last week at Fort DeSoto Beach it seems it was my day to see the unusual. 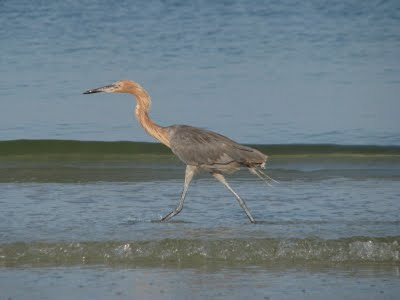 Only a very few minutes into my walk down the beach I noticed a heron-like bird I didn't think I'd ever seen before. I guess that's what made it unusual. It caught my attention with its strange way of flapping its wings and prancing through the shallow waters almost as if it was purposely entertaining on-lookers. There was all of three people on the entire shoreline that early in the morning. 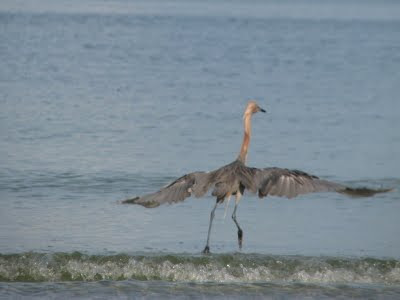 If you've ever seen Sandhill Cranes doing their mating dance you have a good idea of what this lone bird looked like... only it was doing these antics in the shallow waters. And it was obviously foraging for food. It was so interesting to watch. I stopped for a few long minutes to observe and chuckle at my good fortune, took a few photos and resumed my walk. Definitely the ID had me puzzled. 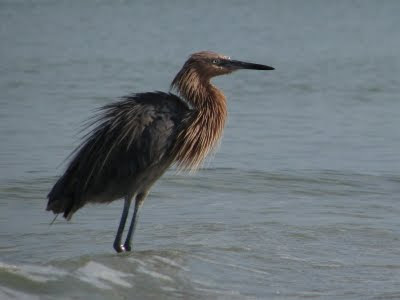 I was thinking maybe it's a juvenile Great Blue Heron ~~~juvenile because the coloring wasn't anything like an adult. I'm not sure I know what a juvenile GBH even looks like... it was just a stab at something. At the other end of the beach I saw another one. It wasn't until I got home to do some research that a better identity was evident. It was decided this fellow must be an adult (I'm thinking non-breeding because of the bill-- but it's just a guess) Reddish Egret, Egretta rufescens. This relatively large and slender species is usually found singly (check) in expanses of shallow salt water (check), where it is very active, chasing fish on foot, running, jumping, and spinning (check, check, check). 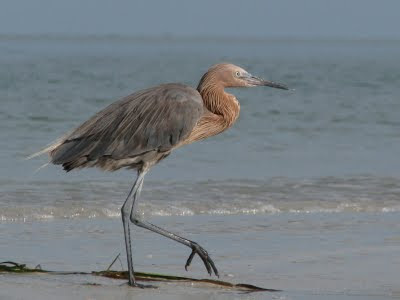 The Reddish Egret is Florida's rarest and most range-restricted wading bird, although it is fairly common in suitable areas. 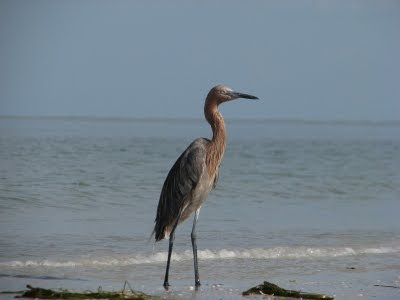 I'm glad Fort DeSoto is a suitable area... for the egret and for me. 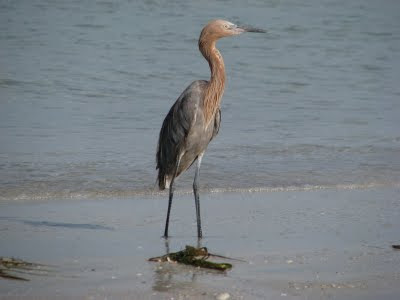 The Reddish Egret is a coastal species with a limited range. Seldom found inland, it breeds along the Gulf Coast of Texas, Louisiana, and Alabama, and around both coasts of Florida. In Florida, the birds nest on mangrove keys. who officially names a bird ... Redd-ish?? Nice shots! It's prettier than a blue-ish heron. I thought that was just fascinating! Cool photos and siting, Meems. what a great happen~stance. 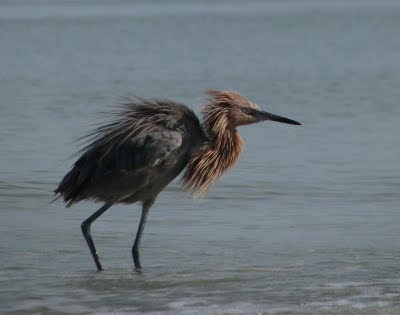 so glad you were able to observe this interesting heron...then id him. i am sure it was great to see him out there dancing about the waves. I am partial to reddish... so it works for me. You know how it is first hand... finding those unusual critters. Not only do we want to soak in their beauty and learn all we can... but getting to photograph them adds even more fun. This behavior is the typical fishing behavior for reddish egrets. I have heard of other species that when they hang out with reddish egrets begin to adopt their fishing methods of using their wing shadows to move the fish. Cool, huh? Welcome to FTLOF! A Tallahassee girl is always welcome... Go Noles. One of my sons and his wife lives there. Wonderful captures. 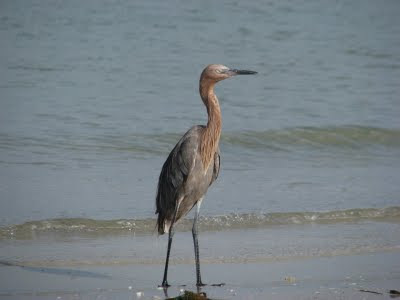 I just saw my first Reddish Egret in North Palm Beach, FL and was at a loss to what it was until I stumbled upon your blog post. Thank you so much!